This weeks Bloggers Challenge was Inspiration. This is was I gave the players this week to get inspired by. 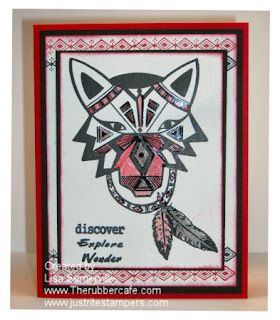 I stamped my new Wolf image from The Rubber Cafe in black and used the Embossed Watercolor Crayon Technique to add some color. For the background I used my SAMJ and stamped the Diamond Bar in Black and Red. The words on my card are from the JustRite Small Words Pre-Inked Travel set. I love these pre-inked images - quick and easy, and you can combine the words from various sets to create sentiments too! If you'd like to play along with this weeks challenge, simply leave a link to your creation on this post, or if uploading to SCS, use keyword BC68. Looking for some additional inspiration - check out the talented Bloggers Challenge Players. Wow...this is striking, and an image I've not seen before. Great job. Your technique is just perfect for this image. He really pops out at you. I love how you used the borders at the topand bottom of the image. Super job, and greattake on this challenge. Amazing concept! I luv your inkspiration here. cool! Love your take on the inspiration! What a fun image.Love this card. Wow! Great card Lisa, how different and creative! Fun.....great card! Love the simplicity of it...but then, those simple cards are usually more work than they seem! I'm truly having a fabulous time seeing how we all interpreted the same sketch so differently! This was a fun challenge...and they are all amazing! Lisa...You've done some fabulous stuff with this stamp set and this is no exception. The colors are perfect for this bold image. Wow, that just jumps at you! It's awesome and so unique! I love it! I love all of the layers of color that you used and then the diamond bar really frames it for a perfect finish! Very nice Lisa and what an unusual image! WOWZA! Totally unexpected and rockin! I love your take on this challenge. Great card. This is a very cool card! What a great image! Wow this is cool! I've never seen that stamp. You really made it pop! Cool! What a striking image--perfect for this challenge. Wow!! this is distinctive!! turned out great! Wow! this is wonderful! I love the "sharp" edges! great job with this challenge! I think everyone loved doing this one! Wow...you really thought out of the box on this challenge. Striking image! Nicely done Lisa! Very bold image. It's awesome!